What Do You Do When You Run Out of Gas? There have been times in my life when I have just “run out of gas” as the saying goes. Most of the time I couldn’t put my finger on it; what exactly was it that was wrong? I would take a look at my life and be forced to say everything was really OK in the grand scheme of things. But never the less, something wasn’t right. I no longer found joy in growing this business I had always loved so much. Does this sound like you? 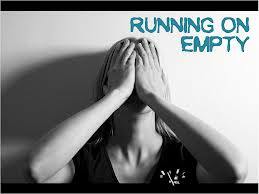 Are you getting close to running on empty? If it does, you’d better take note and do something about it before you crash and burn.